For the fourth consecutive year, the Department of Dentistry and Oral Surgery Services (DOSS), together with St. Luke’s Foundation, the Outpatient Department (OPD) and the Medical Social Services Department, conducted the free dental clinic “Ngipin Mo-Alagang St. Luke’s.”This activity culminated the celebration of the Annual National Dental Health Month of February which was conducted along with the month-long hospital wide dental health awareness campaign. 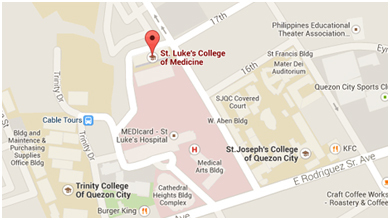 Thirty dentists from St. Luke’s – Quezon City, led by DOSS head Dr. Ma. Victoria Pangilinan, 3 doctors, and 16 nurses and volunteers rendered their services to about 200 patients at the Outpatient Department (OPD) of the hospital. Aside from tooth extraction and fluoride varnish application, the patients also received medical screening at the triage section and lecture about proper dental care through actual demonstration and film showing at the OPD waiting lounge. Each patient also received free medicine supply and loot bag containing toothbrush, toothpaste, mouthwash, dental health educational materials, towel, and tumbler. Event sponsors included the Women’s Board of St. Luke’s Medical Center – Quezon City, United Bayanihan Foundation and St. Luke’s Marketing Group. Photo above shows DOSS Head Dr. Ma. 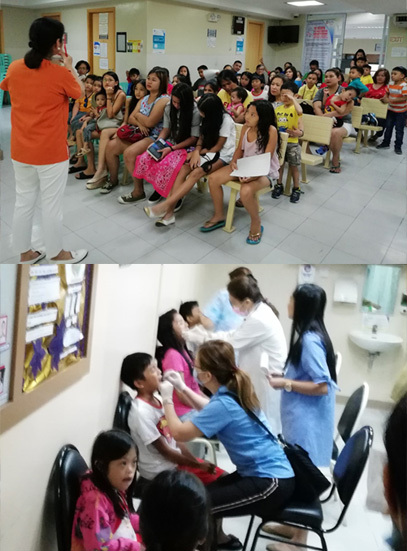 Victoria Pangilinan orienting patients on proper dental care (top photo) as volunteer dentists apply flouride varnish to kids (bottom photo).